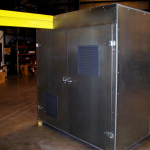 Customer Requirements: A sound enclosure for a hydraulic power unit. The unit must provide sound attenuation, be able to contain hydraulic fluid in the event of a line rupture, and have a 1 hour fire rating. To assist with maintenance and equipment removal, the customer required an I-beam capable of supporting a 2300 lb. load via a trolley. Final Design: Pathfinder Systems constructed the skeletal frame of 4″ x 4″ x 11 Ga carbon steel tubing with an exterior skin of 14 Ga galvanized sheet. A cut-out in the header allowed for the 6″ I-beam to pass through the enclosure. The interior was lined with 18Ga galvanized sheet to repel hydraulic fluid in case of rupture. The interior skin was sealed with a water-based, high temperature caulking compound called Flamesafe® FS 900+, a versatile; toxin free product that provides up to a 4 hour fire rating manufactured by Rectorseal. The customer required the enclosure to be able to contain a fire for one hour, consequently, it would not contain a fan. 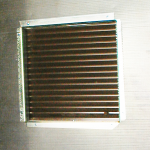 To facilitate air flow, we used two Anemostat® Fusible Link Louvers with a two sided security grill with 40% free air flow. Stainless steel operating springs assure proper closing action of the mechanism if the enclosure reaches 165°F and the louvers are certified by a UL fire rating. 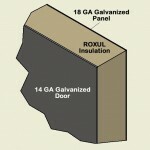 The sound attenuation was achieved using Roxul CurtainRock® 80. It is a wool fibre insulation made from basalt rock and slag. This combination results in a non-combustible product with a melting point of approximately 2150°F (1177°C) which gives it excellent fire resistance properties and it is approved by New York City (MEA). 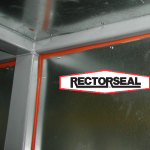 In addition, this insulation provides up to 20 dBa attenuation, has a surface temperature of 1200°F (650°C), is non-corrosive, has excellent moisture resistance, and is CFC and HCFC free. The customer was satisfied with the design of the enclosure and placed an order for a second enclosure.